Tomorrow is a big day. I am getting my very first pair of glasses. Last week I admitted to myself that my eyes are not as young as they used to be and decided to have an eye test. Turns out I have very healthy eyes and excellent long distance vision but I could do with some reading glasses. Instead of feeling all down about getting older and my body not being what it used to be I am actually quite excited. I'm still not sure if glasses actually suit me but I don't need to wear them all the time so it doesn't really matter. I am hoping they might make me feel a little bit sophisticated. Intellectual even. I might chew one of the arms when I need to consider something deeply. I will let you know how I get on! I plan to take a photo of my new eye wear but in the mean time here is a spectacle based photograph which is really lovely. I love the colour and tones and it is a really calm photo. 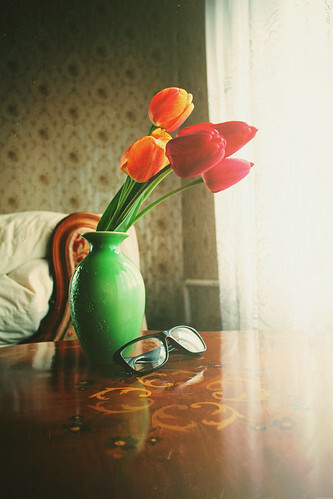 What interests me the most though is the fact that the glasses are facing the window and the tulips are leaning that way too. It's almost like they are looking at something particularly fascinating outside. I wonder if the objects were purposely positioned like that or it was a happy accident. Either way it is a really great photo. Speaking as someone who works in an opticians and helps people pick specs all the time (though ironically I can never find a pair I'm happy/comfortable in!)... take your time in the picking. Listen to the person helping you, but in the end go with your gut and if you find yourself going back to the same frame over and over. It's probably the one you should have. Also, make sure it's comfortable, that they take time to fit it properly and, I don't say this as someone whose pay check comes out of someone like your good self's choices, but pick a decent lens (again listening to the opinion of the dispenser they'll steer you right) but trust me, a good quality lens really does make a difference over its cheaper counterpart. It's not just a gimmick to make you spend more money, I've had cheaper lenses when I was younger, more expensive lenses since I started working at the optoms and in the cheaper lenses, my vision wasn't as good. Plus, have fun! I love helping people pick specs! It's the best part! Try on everything, even the ones you don't think will suit you because you would be really surprised, some specs people totally right off actually end up being the ones they really suit. Okay, I've geeked out enough. Can't wait to see what you pick!